Yesterday morning, during a break between stockings and presents, I slipped away to the bathroom to put in my contacts. 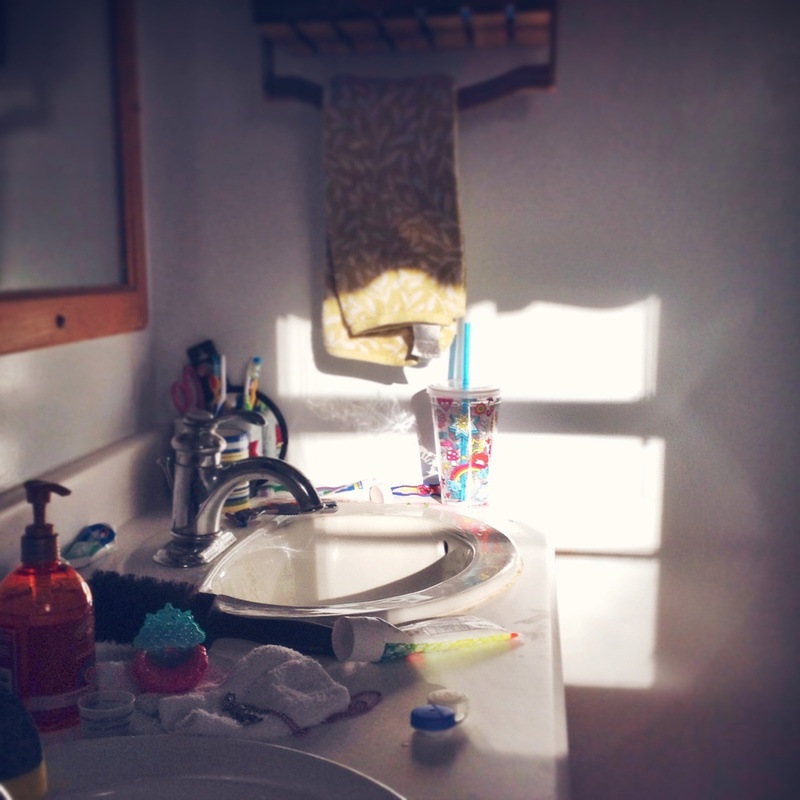 The sun in the backyard reflected against the snow and lit up the bathroom with the most amazing light. The night before I’d fallen asleep on the couch; our cocker spaniel like a heating pad at my side. When I crept upstairs I didn’t even turn on the light as I brushed my teeth. My usual decluttering went undone. Surveying the counter—a medicine measuring cup alongside an Ariel bath throne, a letter F charm necklace, several tubes of toothpaste, a beloved tall, “straw-cup,” craft scissors, Rainbow Loom bands, hair ties, raised gem stickers, and thick rivulets of dried…toothpaste? Soap? Paint? Instinctively I reached for the spray bottle and a paper towel, but as I moved I watched the water cast wavy shadows on the wall. I inhaled the scent of shampoo and damp towels, scanned the mismatched socks listing out of the hamper, the super hero underwear, and the clear pitcher for rinsing sudsy hair that the girls call, “the grey thing.” The pitcher had a mermaid fin sticking out of it and dog shampoo lay on its side below. My breath caught and I realized how lucky I am; how incomparably beautiful and privileged this still life is —this life is. The hard-to-explain, yet familiar sensation I associate with being a mom, it’s butterflies in my belly and a lump in my throat, sadness and soaring joy in the same breath, enveloped me. I took a picture with his iPad, the screen embossed with tiny fingerprints and smears. The order I so crave, will soon enough be replaced for a longing for the clutter of child-rearing. Hair to braid and socks to sort, laundry to fold and meals to fix, they are all the chores that can weigh me down, but bathed in the light of a Christmas morning sun I knew that they were get-tos, not have-tos, and I wept happy tears at the mirror. Yep. One day there won’t be a spiderman in permanent webslinging pose lying on the floor for me to step on. And there won’t be books, books, books everywhere and art projects in various stages of completion on the table. And nobody’s underpants will be lying on the stairs or on the trampoline in the yard. And I will wish there were. Oh, the books and the drawings. You capture the sublime in the mundane with such piercing and poignant precision. Thank you for sharing this fleeting yet indelible moment. Look forward to your next post! Thank you, Mina. Your comment means the world to me. Beautifully said. I struggle not to wish time away. Every grandmother I’ve spoken to speaks of their childrearing years as being their happiest. They do, however (and thankfully) acknowledge that it’s rare to feel that way in the middle of it. Somehow chaos has the best way ever of showing love all around us and can be the most comforting thing in the world.